Are you dizzy yet? 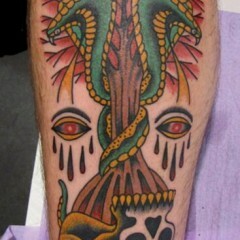 This guy’s complex tribal tattoo depicts a coiled serpent, inked in black and white on his forearm. This guy’s tribal tattoo includes a large tribal snake coiled into a circle, with just the one side of his head visible. The snake’s body is made up of several different designs, many of which are geometric. The tribal design on the snake’s body incorporates visual effects using shapes and color to make the serpent look three-dimensional. 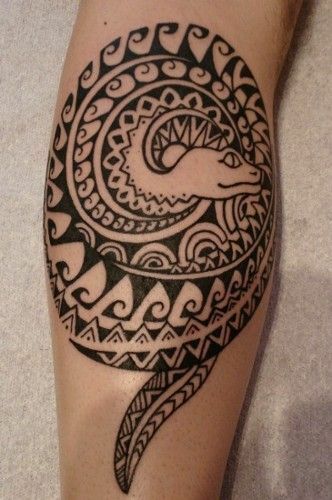 The serpent tribal tattoo is inked in black and white on this guy’s forearm. Even though snakes are often associated with evil and temptation, the serpent has become a popular image used in tribal tattoos for men. This may be because snakes are often seen as a symbol of male fertility…but that’s just a guess. 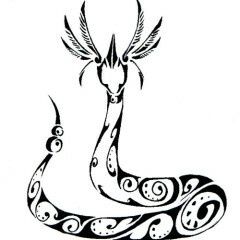 Serpent tribal tattoos may also represent power, cunning and strength. Any of these is a good reason for a guy to get a snake tribal tattoo inked on his body.